This tutorial is for people who want to convert a deco object into a functioning food ingredient. This is useful for deco objects that already have a lot of recolours and you don't want to lose the recolours. Otherwise you would just convert an existing object that does the trick. Open the deco object with simpe (just regular Open, not open from Object Workshop). You can just double click on the package file and then it will open. 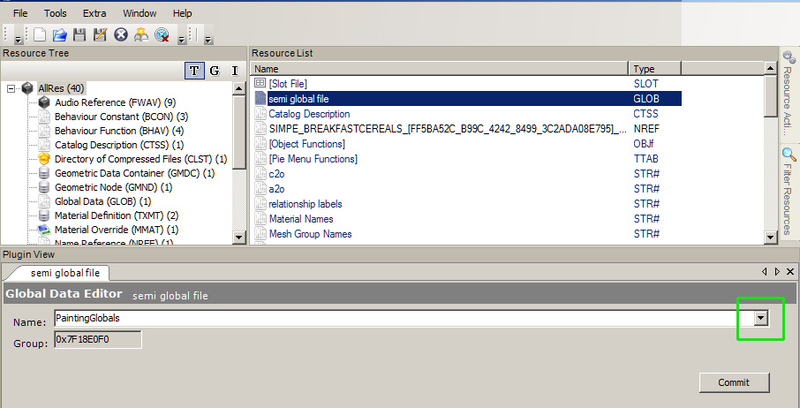 Go to the resource list and click once on the semi global file (see the picture, now it will be highlighted). Using the dropdown arrow on the far right select HarvestableGlobals and press commit. (Look at the picture, the dropdown arrow is the thing with the green box around it). Now we need to remove all the existing BHAVS, BCONs and Text Lists (except one). 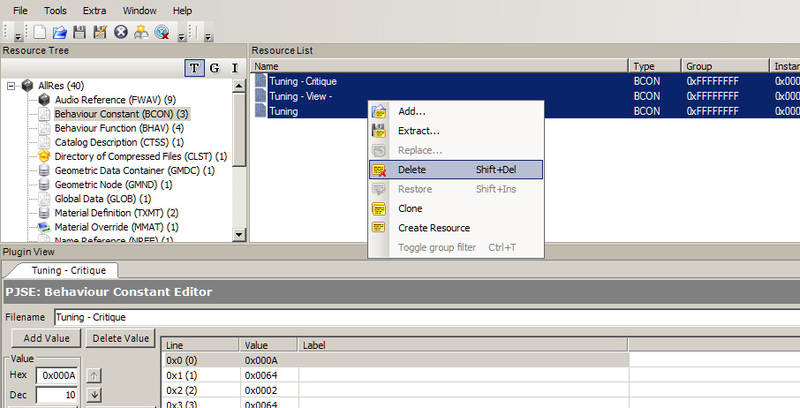 You do this by clicking on the group name in the resource tree (left pane) and then click once on the files in the resource list (right pane). See picture, you can select more than one at once. Then right click in the resource list on the right and press delete. Do not delete the Text List with the resource ID 0x00000085 (133). Copy the modelname without the ##IC500000! gubbins and save it in a notepad file. You will need this for fixing integrity. Next, import all the files from the attached rar. Right click on the resource list and press add. Open each of the folders in turn and select all of the files and click on the Open button on the bottom right. Press save. Open the OBJF (Object functions) and check that the BHAVs are correct. In the object I used to make this tutorial they were not correct, see the picture, the init needs to have the last 4 digits of the resource number of the init BHAV (in these files, the init is 0x1000 and the main is 0x1001). If any other lines are filled in other than the init and main you can remove them by highlighting that line and changing the bhav number to 0x0000. You change the number by clicking in the box with the green square round it (see picture) and typing the number in. You can backspace one digit and make the change. Press commit. Now we need to edit the OBJD to make the stock option on the fridge work and to make sure the object will show up on a community lot. See the picture, I have highlighted 3 areas with a green box. Firstly, set the numbers to decimal. Then, change the community sort to 130 and then scroll down to the miscellaneous section, and change the selector category to 124. Commit. Last step, editing the BHAV to make the restock work. In the resource list, click on the BHAV "CT - Restock Replacement". In the picture you will see that I have highlighted 4 boxes on the right. These 4 boxes represent the GUID. You have to change the values in those boxes to be the GUID of the object you are editing. Example: if your GUID is 01456d18 then box 1 has 01 in it, box 2 has 45 in it, box 3 has 6d in it and box 4 has 18 in it. You edit by putting your cursor in the box and backspace away the two characters and then type in your new ones. Change the guid, press commit and save. 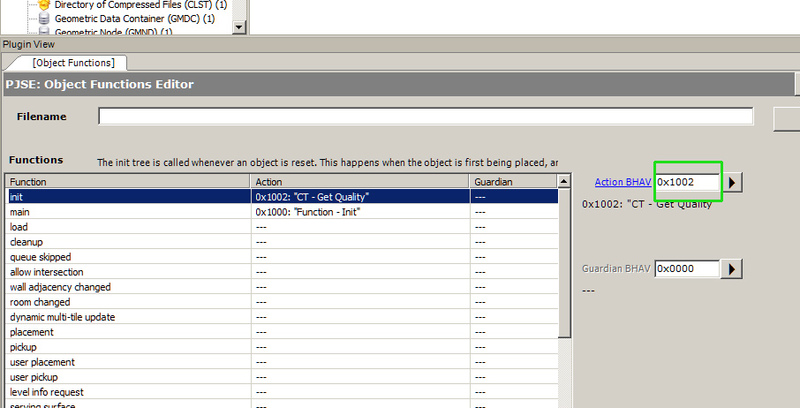 Then from the tools menu at the top left select object tools, fix integrity using the model name you copied, and then save when it has done its thing. The object may not show up in game; if it doesnt show then go to SIMPE Object work shop, press clone, and untick all the options on the clone page and then reclone the object. Use the modelname we already copied to be the name.